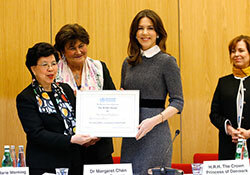 On 23 February 2017, WHO Director-General Dr Margaret Chan presented Her Royal Highness The Crown Princess of Denmark with a WHO Medal in recognition of her commendable contributions to global health. The Crown Princess became Patron of WHO/Europe in 2005. Since that time, she has actively advocated for WHO’s work in a number of areas, most notably maternal, child and adolescent health. As Patron of WHO/Europe, The Crown Princess has engaged in activities to support the annual European Immunization Week initiative since 2008, as well as the more recently established World Antibiotic Awareness Week. She has addressed the WHO Regional Committee for Europe on numerous occasions, and travelled with the Regional Director to Tajikistan in 2014 and the Republic of Moldova in 2016. The WHO Medal was awarded during a reception at UN City in Copenhagen, Denmark. Attendees included representatives of the diplomatic community, United Nations agencies and nongovernmental organizations. The reception also marked what will likely be Dr Chan’s last visit to WHO/Europe as Director-General, with her final term set to end on 30 June 2017. Both Dr Jakab and The Crown Princess took the opportunity to reflect on Dr Chan’s own significant contributions to global health. Each of the 3 women who shared the podium emphasized that they look forward to continued collaboration as they work towards their shared goal of a better, healthier future for all.